#LISSEN. Big Scottish Coo at Halloween. – Andy Wishart Page. Blogs, book info, comments and musings. October 31, 2015 andy1wishartLeave a Comment on #LISSEN. 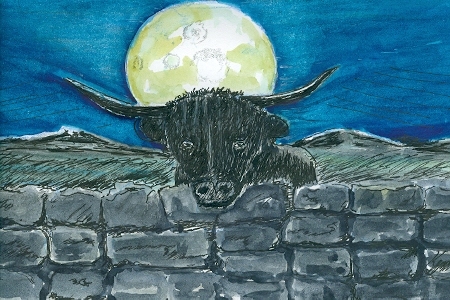 Big Scottish Coo at Halloween. #LISSEN. Big Scottish Coo at Halloween. It was the night before the old Celtic festival of Halloween in Scotland during World War 2. I had ventured out in the dark to filch a large turnip from a local farmer’s field. We had never seen or even heard of pumpkins. Our Halloween lanterns were traditionally carved from turnips. I had just found a large turnip in the moonlight when I heard something move close by. Startled, I straightened up to see what I thought was a monster coming to get me. I panicked and fled. 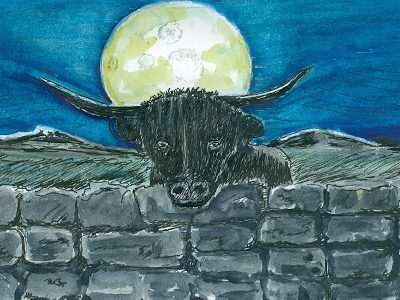 Luckily I was still gripping my turnip tightly when I realised the monster was really just a big Scottish Coo looking curiously over the wall and illuminated in the moonlight. Scary. I almost had an accident in my short Scottish trousers (I was only 8years old then) but made it home safely. The next day I carved the turnip lantern, placed a lighted candle inside it before joining my young friends as, ‘The Guisers’. We then visited our neighbours with the traditional cry of, “Please tae help the Guisers”. We would then troop into each house to entertain our neighbours with a song or poem recitation by each individual Guiser. We might be rewarded with a small bun or cake each. No sweets/candies available during the wartime rationing.